2516 Stock labels at Affordable Alternatives, Inc. These labels are designed for the following labelers: Contact 25-5, 25-88, or 25-99. XLPro265P, XLPro 25-EE, EC, EEA, or EEAA. 1000/roll at the price of the old 800ct roll. .
2516 Blue (sky) plain 1" x 5/8" label roll(s). 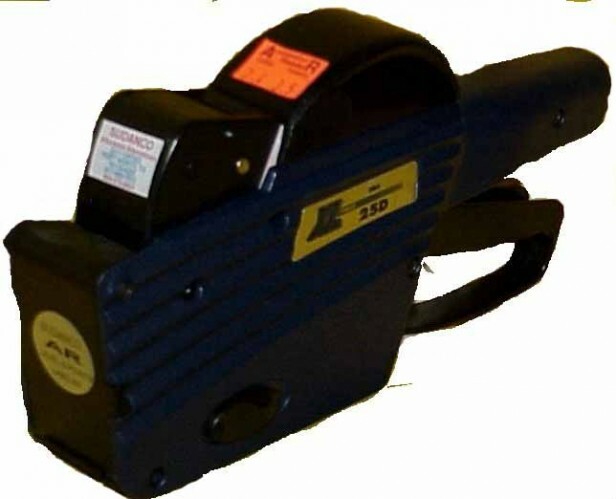 Garvey Contact(TM) 25-5, 25-88, or 25-99 hand-held labelers. XLPro 265P, XLPro25-EE, EEA, EEC, or EEAA hand-held labelers. 2516 Buff (tan) label roll(s) 1" x 5/8" with security slits. 2516 Fl Chartuese plain label roll(s) 1"x5/8". 2516 FL orange (pumpkin) 1"x5/8" label roll(s.
2516 Fl Pink 1"x5/8" plain label roll(s). 2516 FL Red (Tomato red) 1"x5/8" label roll(s). 2516 Lilac (lavender) 1"x5/8" plain label roll(s). 2516 Pastel Pink label roll(s). 1" x 5/8"
Rolls of 1000 plain white 1" by 5/8" labels without security slits. These labels are designed to perform well in these tools: Contact Models: 25-88, 25-99, 25-5 TXM25-5P, 25-8, 25-10 XLPro25-EE, EC, EEA, EEAA, & 265P. Rolls of 1000 labels. without security slits 1" wide x 5/8" tall for imprint in the following labelers: XLPro25-EC, EE, EEA, EEAA, 265P, Contact 25-nn, & 25-5. 1000/roll, general purpose adhesive, 5/8"tall x 1" wide label for marking new jobs. This smaller size may fit items too small for a barcode or that do not have barcodes. 2516 White 1"x5/8" plain label roll(s) GP adhesive. Rolls of 1000 plain white 1" by 5/8" labels with X cut to deter price switching. These labels are desined to perform well in Contact Models: 25-88, 25-99, 25-5 labelers & in the XLPro25-EE, EC, EEA, EEAA, & all models of 265P. 7 DAY LOAN_ $1/DAY FINE_ NO RENEWAL Label Roll(s) G. P. adhesive ylw/red, .625"x1.0" by the roll. Mark items for 7 DAY LOAN, $1/DAY FINE, & NO RENEWAL all on one 5/8"t x 1"w general purpose adhesive label. Yellow label with red text. Replaces item #3719YR-7DNR, so you get 25% more labels (1000/roll), & they fit better on ever-shrinking media. Yellow/red label with removable adhesive for price marking used books, etc. for sale. These labels are designed to work in the TXM25-5P BOLD LARGE print markdown labeler. 1000/roll. These labels are not in stock, yet. There is a minimum order of 6 rolls, until it becomes a stock item. Please allow 30-45 days for arrival of the initial order, then it will be ordered & stocked. Ink roller included with each sleeve of 8 rolls. 2516 plain yellow in labels GP(adh) NSS (no slits) 1"x 5/8" by the 1M roll. Rolls of 1000 plain 1" by 5/8" labels w/out security slits. Price per sleeve of 8 rolls. 2516 plain white labels GP NSS 1"x 5/8" (1M rl) 8M/slv. Rolls of 1000 plain 1" by 5/8" labels w/out security slits in 8M/sleeve. 2516 plain blue labels GP NSS 1" x 5/8" (1M/rl by the 8M slv. 2516 plain fl orange labels GP NSS 1" x 5/8" (1M/rl by the 8M slv. 2516 plain fl chartreuse labels GP NSS 1" x 5/8" (1M/rl by the 8M slv. 2516 plain fl red labels GP NSS 1" x 5/8" (1M/rl by the 8M slv. 2516 plain pastel pink labels GP NSS 1" x 5/8" (1M/rl by the 8M slv. 2516 plain lavender labels GP NSS 1" x 5/8" (1M/rl by the 8M slv. 2516 yellow plain labels GP NSS 1" x 5/8" (1M/rl by the 8M slv. Order by the sleeve of 8 rolls. The TXM25-5SP has 5 large number bands that imprint on a 1" x 5/8" label (2516 size). You may use any of the several colors of labels offered. Changing colors might mean something to your business, perhaps a different color for each month, or year of arrival. to assuue proper rotation. TXM25-5-5 bog & bold # labeler. This labeler is designed to imprint bold numbers up to "99999" on the P2516-labels. This makes it easier to read, and pisk. You may use any of several colors form our stock to aid in rotation and quality control endeavors. Five year warranty.